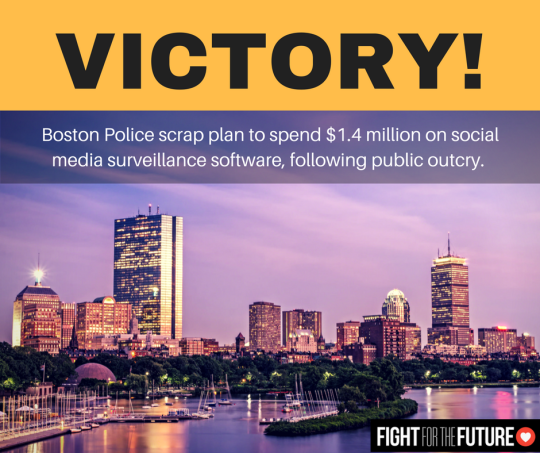 The Boston Police Department announced yesterday that – for now – they will not be moving ahead with their plan to spend $1.4 million on social media monitoring software. The announcement comes amid growing public outcry about the plan, which would have given local police Orwellian capabilities to constantly scan and analyze online speech in the area. Last month, digital rights group Fight for the Future and a dozen other civil liberties organizations sent a letter to the mayor and city council calling for them to halt the plan. In coordination with the Massachusetts chapter of the ACLU, they also collected thousands of signatures on a petition from Bostonians opposed to the deal. When the Boston Globe issued a misguided endorsement of the BPD plan, Greer wrote a rebuttal, which was widely shared. BPD drew even more criticism on the plan when it was revealed that they had bent the rules in the Boston Trust Act in order to hand over at least 9 people to federal immigration officials for deportation, violating a city policy preventing cops from getting involved in immigration enforcement. “City governments and law enforcement agencies around the country should take note of what happened here in Boston. The public will not allow them to waste our tax dollars on dangerous tools that won’t make us safer but will enable mass discrimination and violations of our rights,” Greer added.